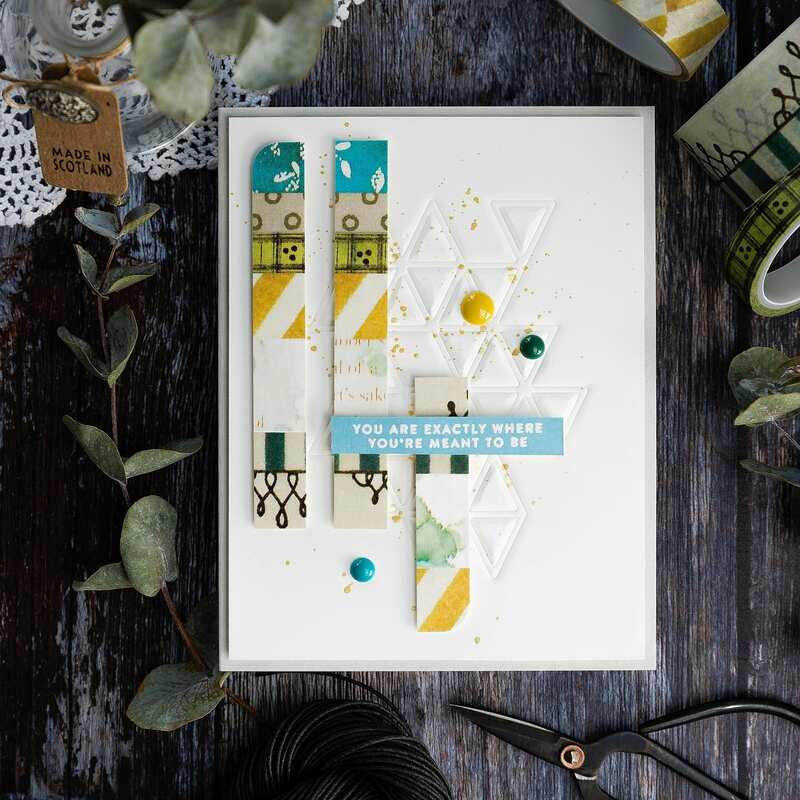 OK, hands up – who here is a washi tape hoarder?! I have been known to buy a few rolls and stash them away all pretty in a draw ;) However, when I got some new rolls of washi tape from Wendy Vecchi for Ranger the other day I challenged myself to use a little of them before my hoarding tendencies could kick in! I’ve linked all supplies at the end of this post. Compensated affiliate links used where possible at no cost to you. 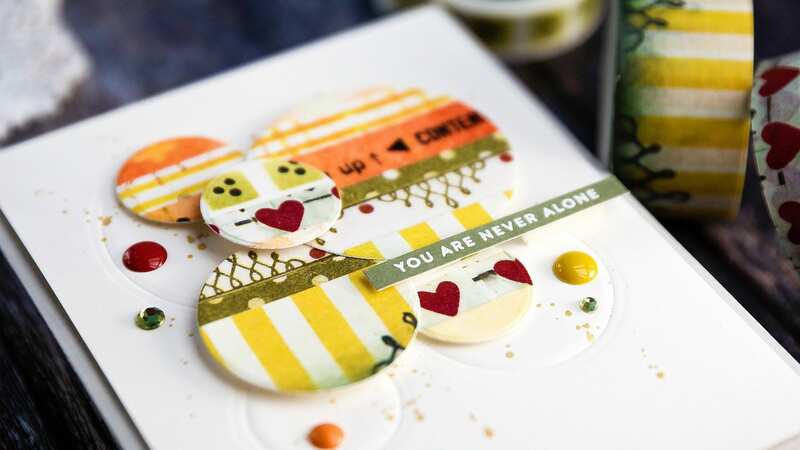 I have two simple cards to share today using washi tape as the main focus. 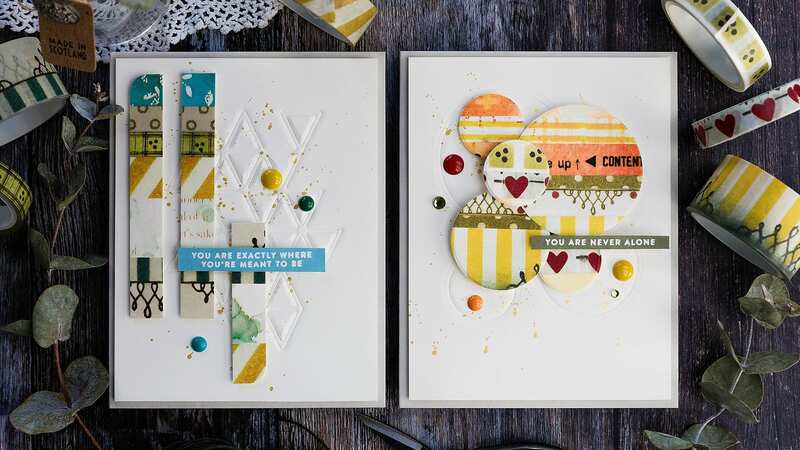 Both cards utilise applying strips of washi tape to a piece of card and then cutting the panel up to create interest. 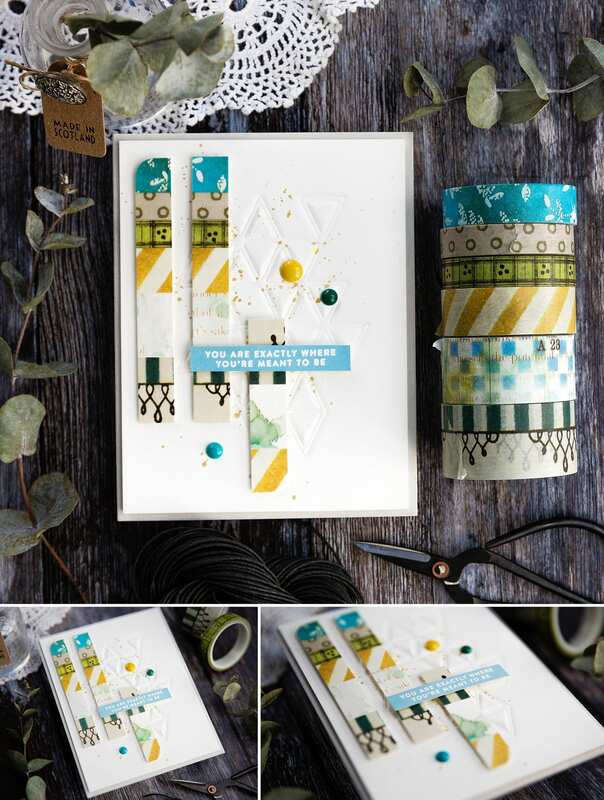 This first card uses the Wendy Vecchi Make Art Washi Tape 1 pack – a delicious mix of mustard yellow, emerald green and bright blue with neutrals to offset them. The tapes looked so gorgeous in their pack that I lined them up in the same order and added the strips to a piece of Ivory card. I then cut three narrow strips and rounded the corner of two of the ends. 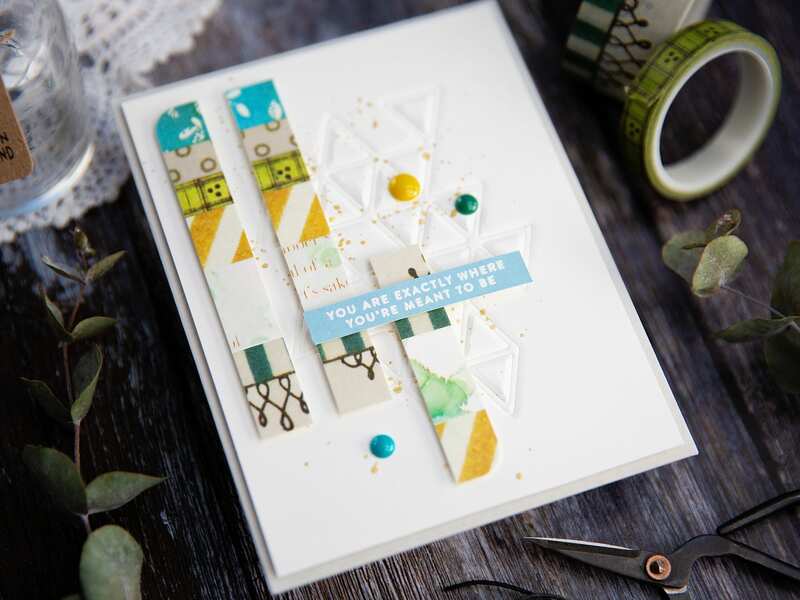 I ran the Triangles Element die from Simon Says Stamp through my die cutting machine with the embossing mat and a piece of Ivory card. 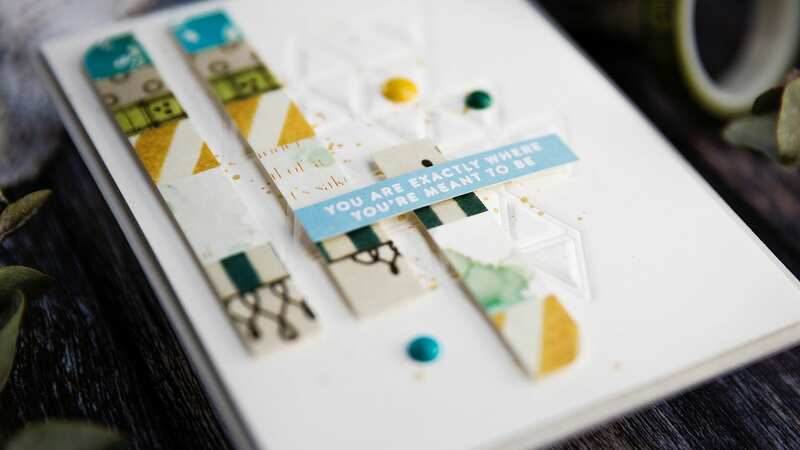 I love how this subtle pattern adds something to the card without distracting from the focal point. I splattered the panel with Iridescent Gold watercolour for more interest. I arranged the three strips over the embossed design and kept them in place with foam adhesive. For the sentiment, I rubbed Wendy Vecchi Sky Blue ink over a piece of card and then when dry stamped a sentiment from the Tiny Words Faith set from Simon Says Stamp in clear embossing ink and white heat embossed. I added the sentiment over the washi strips with more foam tape and then added the panel to a Fog card base before accenting with enamel dots. I really enjoyed making my first simple washi tape card, and so I made a second using a similar design. 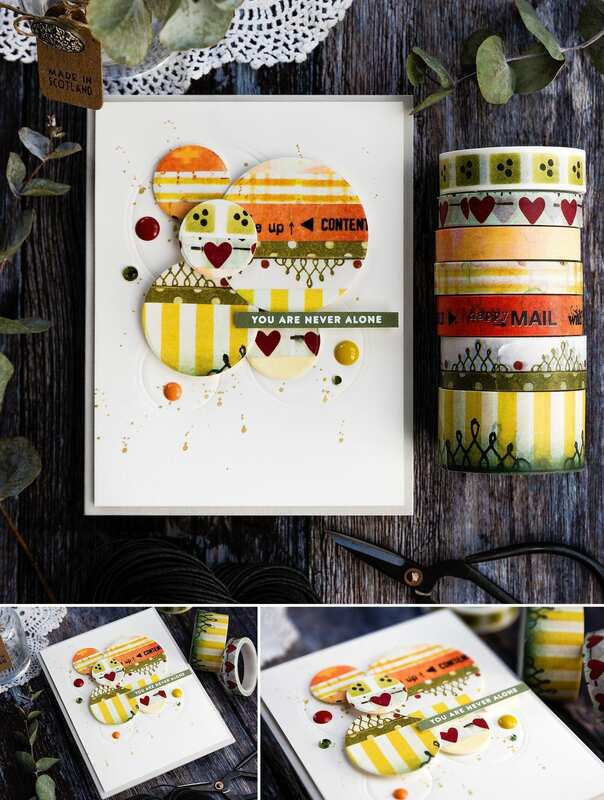 This time I used the Wendy Vecchi Make Art Washi Tape 2 pack – a rich, warm pack of yellows, oranges and reds. Again, I used the arrangement within the pack to determine the order of the strips on the piece of Ivory card I applied them to. Then when I’d covered the piece of card, I die cut as many circles from it as I could using the Nested Circles dies from Simon Says Stamp. 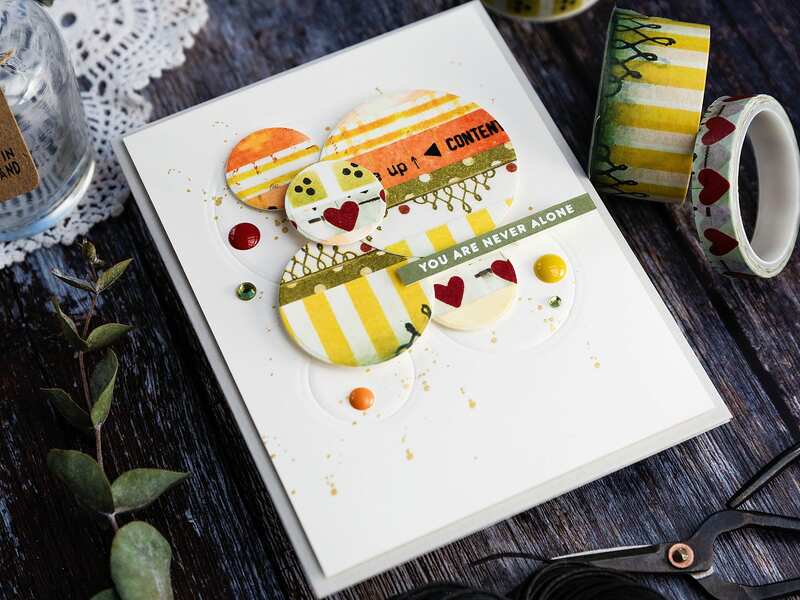 I embossed a trio of the circle dies into a panel of Ivory card and again splattered with gold paint before arranging the washi tape circles over the top using foam tape to secure. For the sentiment, I again used the Tiny Words Faith set, and white heat embossed a greeting over a piece of card that I’d rubbed Wendy Vecchi Peat Moss ink. I added the sentiment with foam tape and then added the panel to a Fog card base before accenting with enamel dots and gems. I really enjoyed challenging myself to use my washi tape rather than hoarding it, and now the world is my oyster, and I’m going to washi all the things! You can find links to the supplies I’ve used below; click on the picture or shop icon to get taken directly to the product. Where available I use compensated affiliate links which means if you make a purchase I receive a small commission at no extra cost to you. Thank you! Items marked with an asterisk (*) were provided by a store or the manufacturer. You can read my affiliate and product disclosure here. I genuinely appreciate your support. 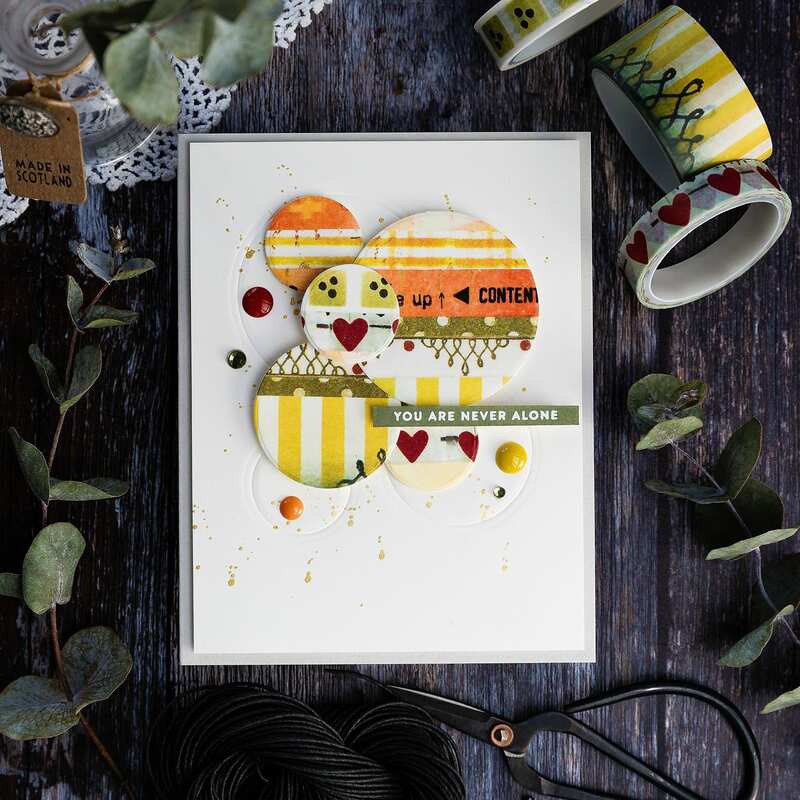 wendy vecchi at Simon Says STAMP! 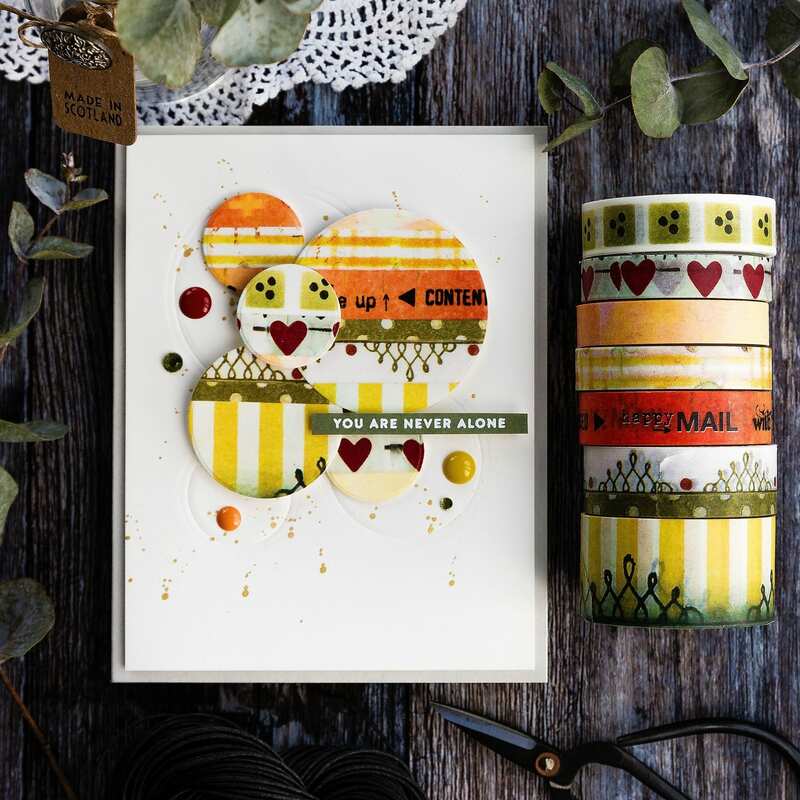 wendy vecchi washi at Simon Says STAMP! I love these cards. I too hoard washi tape. I am definitely inspired by your cards. How do I use the dies to emboss without cutting through the paper? Hi Denise, you need to check out your die cutting machine but basically you use a squidgy embossing mat in the sandwich which causes the die to push into the card rather than cut it. OH THANK YOU! I am a fellow washi tape hoarder! My sister and my bestie know how much I love washi tape and have gifted oodles to me. 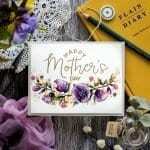 I have been searching for card examples that differ from what I normally see and do. You knocked it out of the park, and I am so very grateful!!! 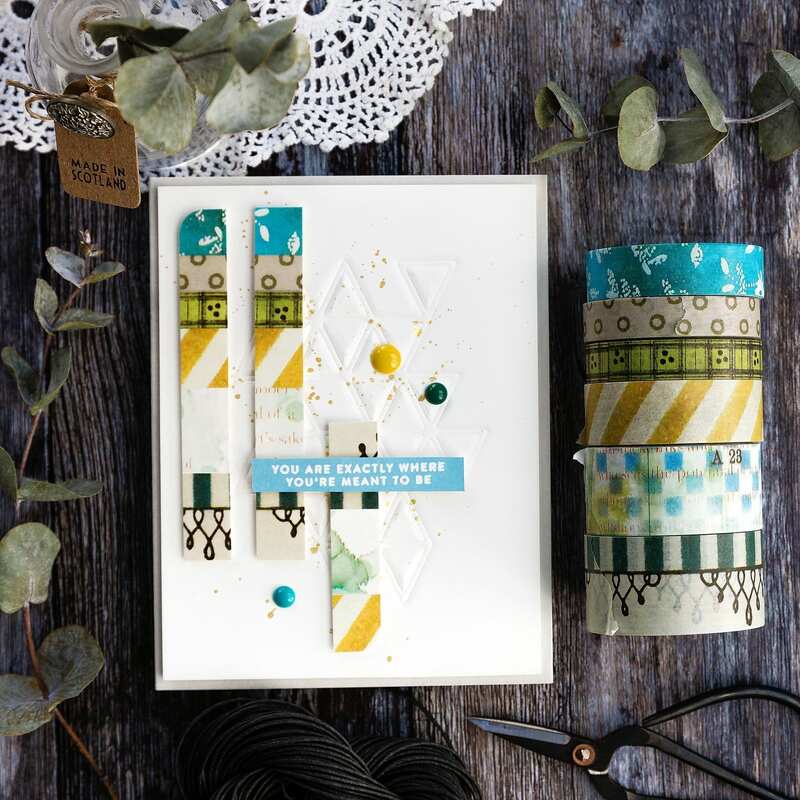 I have a large washi tape addiction and am always looking for new ways to use it – thanks for the inspiration!